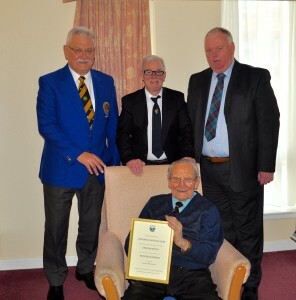 Past President’s Bobby Lee and Willie Robb along with Committee Member Laurie Pae went along to the North Merchiston Care Home to present Charlie with the Scroll to day Monday 20th April. For a Man of 100 years young he is still as witty now as he was 40 years ago some family Members were there including his Son Derek, and Daughters Christine, Elspeth, Grandson Craig and his Children Campbell, and Charlie grand kids were there . A bright Sunny day welcomed the Members to the Start of the Season President Gordon Wilson welcomed all the Members that turned up and hoped all have a very good season. Vice President Grant Young said that he hoped both first and second XVI,s do well in there Leagues then the fun started the teams picked and off we went on to the hallowed turf which was look good after the weather we have had. Presidents Wife rolled the first bowl and a gust of wind all of a sudden appeared making the bowl to waiver off course from the Jack. Thirty Six members started playing and it was a triple that was first out off the traps jumping into a 10 shot lead with New Member Larry Sorrell rink doing the same then all of a sudden a great roar went up all over Cannonballs as Jimmy Bathgate,s rink got a Seven of Allan Mitchell,s rink and went on to win in comfort zone the scores don’t matter on days like this as it good to get outside playing again as someone said. When the game was finished we were all given a choice of meal being Soup, Chicken Curry or Steak Pie with Cake and Cheese and Biscuits to follow a big thanks to all the Ladies that done the meal. the Presentation was made to the nearest to the jack and it was won by Jamie Reid the highest up was The Prentice Boys in his closing speech President Gordon thanked all the Ladies for the meal and that the Vice President side had won the day over all then he said that the Music /Karaoke would follow shortly and that went on to the wee small hours. Triples Lose at in Bowls Scotland at Craigintinny. Seniors Lose Bowls Scotland Semi Final against Goldenacre. First Silverware of the Season was a double by Andy Reid the two bowl Singles was up for grabs on Saturday that was followed by the two bowl Pairs which he also won with Gordon Wilson (Sen) the day started of badly for Robbie Paterson who go stung with a wasp and he went downhill from there. When the draw was made New Member Callum Anderson was to play Garry Harrison and the stats went out the door as Callum won the game. Callum also supplied the pies for the food which went down well with the Members .The banter in the club after was very good for some !!!!!!!!!!!!. For 1st and Second Sixteen Club Polo Shirt (White with blue and yellow piping) and Grey Trousers White or Club Top . Club Blazer is optional.